Ioanna Spanou – Master in Landscape Architecture Barcelona – Universitat Politècnica de Catalunya – 35ª EDITION. 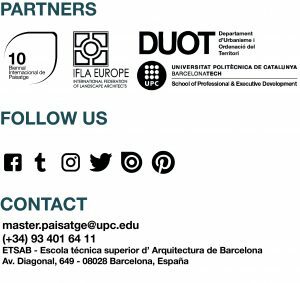 Architect, PHD candidate ETSAB, DUOT, UPC. Studies architecture in NTUA (Athens, Greece) where she later on earns the Master’s degree: Inter-Departmental Postgraduate Programme: Architectural Design – Space – Culture. In 2002 she moves to Barcelona in order to course the Master in Landscape Architecture (MAP, UPC, 2004). Since then she combines the academic with the professional activity. She collaborates with Biaarq arquitectes, the Centre de Recerca i Projectes de Paisatge (CRPPb, UPC) and with (az) estudis i projectes de medi ambient i de paisatge, while she continues her studies with the Master of Investigation in Urbanism (UPC 2008). At 2010 she founds azimutlandscape studio with Margherita Neri. Among her selective creative work: the first prize at the international competition for the design of the ¨Can Escandell¨ Park in Ibiza, with Margherita Neri and Anna Zahonero and the collaboration in the competition, and the construction of the ¨Greenaway of Cerdanyola¨. Since 2006 she is an assistant professor in the course: ¨New Uses for old territories¨, (MAP) and in the ¨Landscape analysis¨ course of the MUP.